What is a confetti shot and how do I nail it at my wedding? 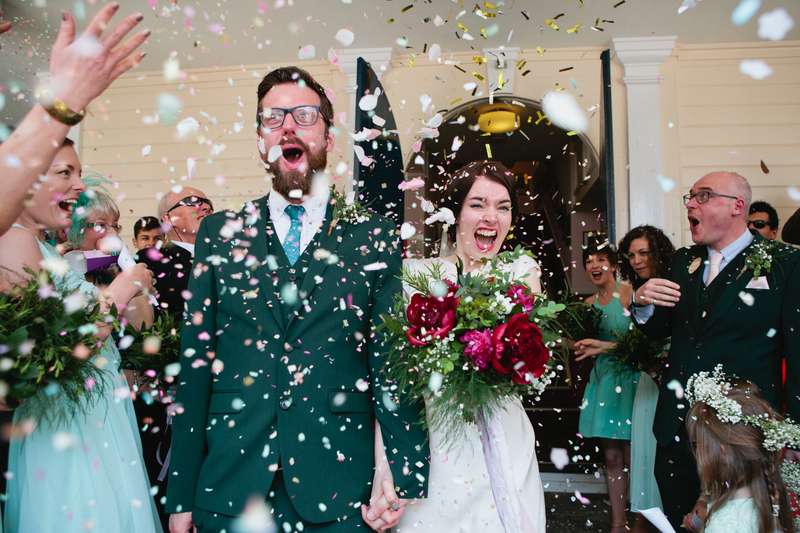 Even with a documentary style wedding photographer, there’ll probably be a few shots you’re really adamant to plan – and one of these is often the totally joyous moment that is the confetti throw! It makes for an undeniably gorgeous photo and is an iconic part of the day for many people. But, like most aspects of a wedding, it does require more coordination than you may think, so here’s some things to consider when planning your confetti shot with your photographer. What is it a confetti shot? The confetti shot is usually staged as you exit your ceremony. All of your guests form a group with a clear path down the middle, which you then walk down as a married couple whilst they throw confetti at you (or, at least, in your general direction!) It’s a really delightful and emotional way to celebrate your ceremony concluding and your new status as a married couple. For couples with a more formal ceremony, it’s a great segue into a more relaxed or more informal reception, and for couples with an informal ceremony it’s an excellent continuation of the feelgood factors. Traditionally, guests would buy their own confetti to bring, but nowadays as more and more couples are orchestrating confetti shots, it’s commonplace for you to supply your guests. Pop them in paper or vellum pouches with hand lettering or your wedding monogram, or have communal buckets of them for guests to grab handfuls from. Commandeer an usher or bridesmaid – or, as always, someone with a loud voice – to remind people to get it ready for the big moment! What type of confetti should I buy? There are so many different types of confetti, it can be hard to know what’s best for your wedding. Firstly, check in with your venue, as many venues have quite strict requirements! For example, stately homes and manor houses may not allow anything dyed in case it stains, and outside areas may not allow plastic confetti as it’s a pain to clear away (especially from gravel paths or flowerbeds.) Areas of conservation usually stipulate that the confetti has to be biodegradable. When liaising with your venue or coordinator, ask them what they allow – and don’t forget to relay the info to eager guests! It’s also worth thinking about the effect you want in your photos – do you want smaller individual pieces, which create more of a flurry, or do you want bigger pieces which will be more striking in photos but won’t stay in the air as long? Do you want colours to match your wedding colour scheme? How do we nail the confetti shot? In my professional opinion, the secret lies in the wrist! You want to ensure your guests are showering you with it rather than attacking you with it. To avoid them throwing it directly in your face ask your nearest and dearest to throw from above. Getting height on it is key! It’s also important to ‘flutter’ it if possible – it’s less a confetti throw, and more of a forceful coordinated confetti sprinkle. I’ll already be in prime position at the end of the walkway, to take the shot of you being showered in confetti and love. From there I can also coordinate timings, to make sure it’s as much confetti as possible, all at once. My venue won’t allow confetti! What can I do? Don’t worry! If a confetti shot was something you really wanted to do, we can figure out an alternative (or do it anyway)! If your venue won’t even allow a confetti shot with totally natural confetti like Shropshire Petals or traditional rice, why not have a sparkler exit later on? It’s a different vibe as the shot is darker (and people are drunker and therefore slightly harder to herd) but the glow of the sparklers and the collective of everyone you love around you is something to behold. My top five woodland wedding venues in Kent and Sussex Wedding Planning Guide What does documentary wedding photography mean?